Who’ll Conquer the Hardwood in Turkey? EuroBasket 2017 Action Tips Off! Bookie William Hill shares who has the inside edge to be the last one standing at the Sinan Erdem Dome! Podcast Episode #19: First Division A Action in Belgium Hits Full Stride! Who’ll Control Their Own Destiny? Mr. Bookmaker is back with another episode as he checks in with the sportsbooks and odds for this weekend’s football lineup in Europe! 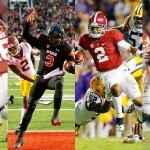 Who Has the Best Shot to Win the College Football Playoff? The Odds for Another Season of Pigskin are Out! Can Nick Saban & Alabama make it to their 4th consecutive College Football Playoff? Sportsbook Bovada reveals all! Podcast Episode #18: The Bundesliga Season Has Arrived! Who’s Favored in Opening Weekend Action? As the last of the major football leagues (Bundesliga & La Liga) commence their seasons, Mr. Bookmaker dives in to find out who the sportsbooks have favored! Sportsbook bet365 gives the lowdown on who’s favored in La Liga action for the upcoming season! Podcast Episode #17: Can an Outsider Mix Up the Eredivisie Table & Win It All? As the English Premier League season gets underway, Mr. Bookmaker also showcases the weekend’s match-ups in Holland’s Eredivisie. Tune in to find out who’s favored! Can Chelsea Defend Their Title? 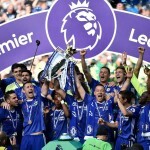 English Premier League Action Takes Center Stage! The odds are out for the upcoming English Premier League season courtesy of bookie bet365! Who’ll be the top goalscorer in EPL action? Podcast Episode #16: NFL Pre-Season is Here! Which Teams are Favored to Win the Super Bowl? Mr. Bookmaker highlights those teams who have the best chance to claim Super Bowl LII in addition to showcasing this weekend’s soccer card in Europe. Will It Be the World’s Fastest Human’s Last Hurrah? Bolt & Co. Get Ready for London! Bookie Coral showcases the odds covering the spectrum of events at the 2017 IAAF World Championships.